Senior exercise classes at our Littleton gym include a range of classes from yoga for seniors and waterworks to Silver Sneakers and Golden Tennies programs. 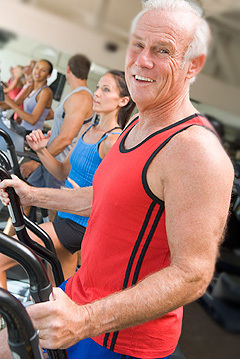 One of the unique attributes of Club USA’s Senior Fitness program are our Social Activities that are scheduled and heavily attended by members. Waterton Canyon walks, Casino Nights, and Senior Prom’s are just a few of the outside, social activities offered, creating a unique bonding opportunity for all. We believe it’s important to offer both physical and social activities to keep the body and mind in the best condition possible. Another great thing about Senior fitness classes at Club USA in Littleton is Silver Sneakers, or Silver & Fit programs can be used to join Club USA & enjoy not only this program but all that Club USA offers. Some Doctor Prescriptions/insurance plans can be used as well. Remember, it’s never too late. Being physically active can help you continue to do the things you enjoy and stay independent regardless of your age. That’s why health experts say that older adults should be active every day to maintain their health. Club USA’s senior exercise classes in Littleton, Colorado are designed to do just that. Contact us at (303) 979-7772 today for more information on participating in SeniorUSA.